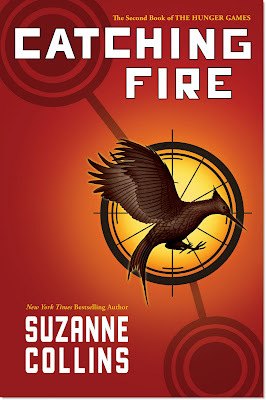 Today is the official release day for Catching Fire, the second book in The Hunger Games series by Suzanne Collins. I have to say The Hunger Games was perhaps my favourite YA read last year and I have really been anticipating this follow up. In the spirit of the "Games" all you need to do to enter the contest is leave a comment and tell us what your favourite Olympic event is and why. The promotion runs from September 1 to September 15, 2009. Winners will be announced on or around September 16, 2009. Open to participants with a United States or Canadian mailing address. Read the Chapter 1 excerpt of the book or listen to Suzanne Collins read Chapter 2. Lev Grossman at Time Magazine has this review of the new book. The Book Smugglers has a wonderful review here. Read an interview with Suzanne Collins here. My favorite Olympic Event is Hockey! Me and my son jump into the pool any time we can. Favorite olympic event? Tough one.. I love to watch the equestrian sports. I used to ride horses (when I had the time and money) and it makes me remember the good times. I love the downhill skiing because it always looks to me like everyone's going to die, but then they suddenly pull through it. It's amazing. I agree with RKCharron,hockey is favorite olympic event,Go Canada a national past time to watch.I like both the women and men teams. My favorite event is gymnastics. My favorite olympic event is the louge, I love speed! I am really excited to read this series, I am hearing great things about both books. My favorite Olympic event has been and always will be Women's gymnastics. They're incredible athletes! Looks to be a great read! For Winter Olympics, it would have to be Skeleton. The speed, the daring, the precision... I'm always enrapt. For Summer Olympics, my fave would have to be either Volleyball or Olympics. Both are great fun to watch. Great athletes, jumping tremendously high, the strength, agility... amazing to watch. OMG, I loved The Hunger Games and can't wait to read catching Fire!! I love the swimming Olympic event! Why? Because swimming is my favorite sport! I love watching synchronized swimming because it so ridiculous. And difficult. Plus those little caps they wear are cute. The position for my favourite Olympic event is tied between three sports: hockey, gymnastics, and snowboard cross. Hockey because I'm a stereotypical Canadian, gymnastics because it's amazing to see what the athletes can do with their bodies, and snowboard cross because it's just so darn fun. I can't wait to watch it and hockey this winter! Well my favorite Olympic evetn sure is Hockey! It is my favorite sport, and one of the rare in which we can (Canada) expect a gold medal! Thanks for hosting this awesome giveaway. Those shirts are great! Amazing givaway! So excited for this book. My favorite Olympic sport is swimming. My favourite Olympic event is speedskating! Please enter my name in your wonderful draw. Thanks! I have a few favorites. But my favorite Winter Olympics sport is Curling. It is an absolute hoot to watch and is even funner to play. My favorite even is figure skating. It's so artistic, yet athletic too. And some of the costumes are just priceless. Great contest! My favorite event would be either diving or synchronized swimming (those are some real athletes!). My favorite Olympic event is gymnastics, mens or womens, any of the four apparatus'. So much skill, dexterity, and conditioning needed. Love it all. I love watching downhill skiing. It's exciting--the speed, the danger, the rush. My favorite event is women's gymnastics, because it is so beautiful to watch! I've always loved watching gymnastics. My favorite winter Olympic sport is the figure skating. In the summer, it's the gymnastics. I also love the fencing, but they tend to broadcast it in the early hours of the morning if at all. My favourite Olympic event is figure skating. I like the routines and how emotional they are and also how skaters can do some amazing moves on the ice. I like watching the gymnastics the best, track & field is a close second. I like Curling...it's almost hypnotic watching them sweep the ice back and forth. My favorite is skiing. I just love watching them zoom down the hills and off the jumps. Please enter me! dasuzuki at yahoo dot com. My fave summer event is gymnastics. Not sure why but it's always been my fave. For winter I got into speed skating two Olympics ago. It's so exciting and amazing to watch. Definitely basketball. It's always been my favorite sport and I played some in high school. Gymnastics!! It was so fun to watch although the commentators were ANNOYING as hell. My fav olympic event is gymnastics (more specifically women's all-around). Olympic games: This is totally girly, (and I'm way too old for girly, haha) but my favorite winter olympic games is ice skating, especially when the skaters to something unique, like use rock or hip-hop music. I've always like the skating, ever since I was a little bitty girl. My favoriet summer games is track-I'll never ever run like those guys can. Oooo...great contest. I can't wait to read this. I favor the winter Olympics over the summer ones, just because the sports are more varied and interesting. I really love speed skating. Watching the guys and gals dance on a razor's edge (literally) around and around the track makes me bite my nails and cheer. Figure Skating has always fascinated me.... I think it is incredible has always been my favorite to watch. My favorite Olympic event is gymnastics, because of the amazing skill it takes to do the routines. And because it's like watching Cirque du Soleil! I love the half pipe (snow boarding), gymnastics and figure skating, all because of the agility required for them. And they all visually just look so cool. What an awesome twist to the contest. I'm following you now. I've always loved the gymnastic events. It doesn't seem possible that they can do what they do with their bodies. The combination of grace and strength is beautiful to watch. I think all of the Olympic events are amazing! I am so impressed by gymnastics and all the contortions they perform. 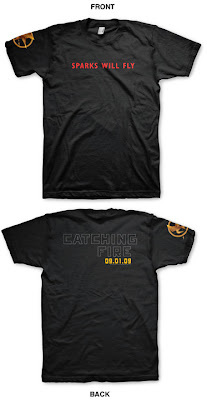 please enter me to win the Catching Fire Contest. My Favorite Olympic event is swimming. I love to swim more than anything. Oh, contests. I like contests. Favourite event would be figure skating because it's so graceful and pretty! It's almost like retro "So you think you can dance" with two people and more rules. If I have to choose a favorite olympic sport, it would be gymnastics. Awesome giveaway! My favorite olympic Games event is ice Skating. I love watching ice skating because I love the costumes and the choreography as well as the amazing moves. Fantastic contest! Thanks for hosting it. My favorite Olympic sport is figure skating. It looks so graceful and effortless. Unlike when I ice skate. Ok my fav is swimming. I don't know why I just enjoy it. Best reason I guess. My favorite Olympic event is swimming. It's been my fave since Rome when Phelps made his debut. I get really into it too, shouting at the TV, it's my Super Bowl! My fav event is figure skating. When my mother was alive, a big thing for us was always watching the winter olympics together. We both loved figure skating and I just feel like she is there with me when I watch it now. For summer olympics my fav is gymnastics. I think it's so cool what they are able to do, and wish I could do it lol Same goes for the ice skaters in winter. My favorite Olympic sport is soccer. Followed closely by the track and field events. Awesome giveaway! I would love to win this book. Thanks for the chance. My favourite Olympic event is Alpine skiing. Even though it's something I could never do I enjoy watching because it looks like so much fun and you never know what's going to happen. I really like watching ice skating in the Olympics because it is very artistic and athletic. My fav Olympic event would be swimming. WOW! These two books are on the Wanton Wantin' Book List, so they will be read even if I don't win. Favorite Summer Olympic event: Equestrian, just watching the smooth movements and the almost psychic connection between rider and horse. Synchronized swimming is a close second. Those athletes are just amazingly disciplined. Winter Olympics: Speed skating, they move so damn fast! My favorite Olympic event is snowboarding, the half pipe is so exciting to watch, it's amazing what they can do! My favorite summer event is diving and my favorite winter event is figure skating. My favorite sport to watch is gymnastics. I love watching the uneven bars. My favorite Olympic Event is Hockey!!!! I love to watch the gymnastic events. Those young people are so talented and graceful! My Mom calls me "Grace", but it's my lack thereof, LOL! My favorite game is between gymnastics and ice-skating. I'd love to be able to do either of those things. I like watching fastpitch softball in the summer because I used to play, and I like watching snowboarding in the winter because I always wished I'd learned how. I also enjoy a little swimming, diving, and gymnastics. I have two favorites: ice skating and gymnastics. I'm so in awe of what they can do and the grace they do it with. It makes me want to go and try it myself. Hands down my absolute FAVORITE Olympic event is Gymnastics! I have been a gymnast for many years! It takes a lot of hard work and dedication and I just think it's a beautiful sport! Thanks for hosting this giveaway! I'm normally a lurker, but I had to come out and post for this one! I love all Olympic sports/games. It is the spirit of the games, of competing that makes it the Olympics. My favorite events are swimming and gymnastics! love the hunger games! thanks a billion for the awesome giveaway!! I have a lot of favorite Olympic events so I'll just name 1 for summer and 1 for winter. Gymnastics: It is so fun to watch and requires so much. Balance, strength, performance, and flexibility. Figure Skating: Same reason I like gymnastics. Gotta love giveaways. I'd say my favorite Olympic sport has gotta be curling. I mean, dudes with brooms? Guys so rarely sweep that we've actually made an olympic event out of it. Awesome. I think my favorite event to watch is track ones, which is weird because I can't run at ALL. Diving. I love watching beautiful bodies do amazing things (oh and to have that kind of core strength). Contact me through moderated comments. Awesome giveaway. I'd love to win, as I've heard great things but never read. My favorite Olympic event is swimming or down-hill skiing. I love gymnastics! Mainly because I wish I could do that! I think its truly amazing how they swing on the bars and flip on the floor exercises! The Hunger Games is such a fantastic series! I can't get enough of it so I really want that mockingjay pin :). My favorite Olympic event is Couples Ice Skating! I've already read the book and it really delivers an exciting and emotional story, just like book one. Winter, I'd go with The Downhill. Speed...danger...awesome. Summer, I'm a fan of the 200 and 400m Individual Medley in swimming. And it's not because my son recently met Ryan Lochte. It's just awesome. Michael Phelps is an American hero; he personifies hard work and a desire to succeed. Michael earned what he has unlike the wall street barons and crooked politicians of the world. The man is an American hero and most of us are proud and awed by his accomplishments in the pool. the fact that Phelps likes a glass smoking pipe, a hand rolled cigarette or big fat bong should in no way diminish the way we feel of the man’s accomplishments. Michael Phelps is doing his job and doing it to the degree of historical human greatness. Our admiration of this man does not give us the right to control his individual destiny or to judge his private choices through a lens of misguided morality. If one can achieve our world’s highest honors then they should be "free" in this country to their own pursuit of happiness. This reminds me of Katniss. She caters to the crowd but just before The Hunger Games, she focuses determined to use every talent she has in order to survive. I loved "Catching Fire" it was Magnificent. My favorite olympic event is pairs ice skating. My favourite Olympic event would be women's gymnastics. Although hockey comes in a really close second! My favorite Olympic event is Swimming or Gymnastics. Please include me in your giveaway. I've just finished the first book. My daughter has handed her copy of the second book to friends at school... So I don't know how long my wait is going to be!!! My favorite Olympic sport of the Modern Games is Croquet. It was only played in the 1900 Paris games with about 10 people... but it _was_ the first time women had competed in the games... most of the competetors were from France, including the women (Filleaul Brohy and Marie Ohnier). There is very little information about Croquet as an olympic sport... but it is my favorite because not only do I enjoy hitting little balls between wickets with my family and friends, but it also fascinates me that the first time women competed in the Modern Games they competed against men. My friends and I have been obsessed with Suzanne Collins since the Underland Chronicles, and we're loving this series just as much as the first. :) I can't wait for the third book to come out! Anyways... Olympic Games, hmm? There's no question- my favorite has to be fencing. It doesn't just require strength, or just require speed, or agility, or anything else- it's a combination of everything that not only makes it beautiful to watch, but also makes it fair for everyone. Fencing is one of the only sports in which woman can compete against men, and that's why- skill and agility, even perception, can make up for a lack in physical strength or speed. Id Love to be entered in the contest!! Baseball is my favorite olympic sport. I love to watch the p[layers from the US all get together and play on one team. I also love diving, just because it is really cool! I'm going to have to say figure skating. The faster they turn, the harder they fall. everead/at/gmail is my contact info. My favorite olympic games would be gymnastics. I'm all about gymnastics. What amazing atheletes those young ladies and gentlemen are! I love diving because I can't even swim myself so it is hard to contemplate doing what they do. For winter I enjoy skating. Great contest! I can't wait to read this book. I love the Olympics! Gymnastics is my favorite sport. I'm afraid I don't have a favorite Olympic event. Can I enter the giveaway anyway? Entering for my 10-year-old son who'd love to win this. My favorite Olympic event is the biathlon. Bobsledding... Because of Cool Runnings. I love watching the swimming events. LOVE them. Thanks for holding this contest! It's GREAT! Loved "Hunger Games" and can't wait for the 2nd and 3rd installments! I love curling. It's like giant life size shuffleboard. Except on ice and with brooms. Gotta go with the Biathlon. Because really, if you're a great Biathlete, aren't you just a James Bond villian? * And it's the only Olympic Event I've been to. *Yeah, I stole that from RvB. Thanks go out to everyone that participated! I'll post winners on Thursday. My favorite Olympic events have to be the swimming competitions, and the weight lifting.